LEDA [lee'da], wife of TYNDAREUS [tin-dar'e-us], king of Sparta, bore four children to Zeus, who appeared to her in the form of a swan. Polydeuces and Helen (who were immortal) were born from one egg, Castor and Clytemnestra (who were mortal) from the other. Castor and Polydeuces. CASTOR [kas'tor], or KASTOR, and POLYDEUCES [pol-i-dou'seez], or POLYDEUKES, whose Roman name is POLLUX [pol'luks], were not part of the Trojan saga. They are known as the DIOSCURI [deye-os'kou-ree], or DIOSKOUROI (“sons of Zeus”) and Tyndaridae (“sons of Tyndareus”). Castor died in a quarrel with the sons of Aphareus, IDAS [eye'das] and LYNCEUS [lin'se-us], but Zeus allowed Polydeuces to share his immortality so that each brother was on Olympus or in Hades on alternate days. Castor was a horseman, Polydeuces a boxer. As gods they helped sailors, and they were especially honored at Sparta and at Rome. Helen and Paris. The most beautiful of women, HELEN had many suitors. She chose MENELAÜS [men-e-lay'us], or MENELAOS, as husband and bore HERMIONE [her-meye'o-nee] to him. The other suitors swore to help Menelaüs in time of need. PARIS (also called ALEXANDER or ALEXANDROS), son of Priam and Hecabe (Hecuba), rulers of Troy, seduced Helen and took her to Troy. To recover her and vindicate Menelaüs, the Achaeans (Mycenaean Greeks) raised an expedition to be led by Agamemnon. Another version says that Helen went to Egypt and spent the ten years of the Trojan War there, while her phantom went to Troy. The Judgment of Paris. Paris took Helen as a reward for judging Aphrodite to be more beautiful than Hera and Athena. All the Olympian gods, except ERIS [er'is], “discord,” were invited to the wedding of Peleus and Thetis (see MLS, Chapter 19). Eris appeared and threw on the table an apple inscribed with “For the most beautiful,” which was claimed by all three goddesses. They were brought by Hermes to Paris on Mt. Ida, where each promised him a reward if he judged her to be the most beautiful. Apollo and Poseidon built the walls of Troy for King LAOMEDON [lay-om'e-don], who cheated them of their reward. To punish him, Apollo sent a plague, and Poseidon a sea monster. Laomedon, obeying an oracle, exposed his daughter, HESIONE [hee-seye'on-ee], to the monster, but she was saved by Heracles (see MLS, Chapter 22), whom Laomedon also cheated of his reward. Heracles attacked Troy with an army: he killed Laomedon and gave Hesione as wife to Telamon. Priam and Hecuba. Laomedon’s son, Podarces, became king of Troy, changing his name to PRIAM [preye'am]. He had fifty sons and twelve daughters, nineteen of the children by his wife and queen, HECABE [he'ka-bee], whose Romans name is HECUBA [he'kyou-ba]. Of these, Paris and Hector were the most important. Paris and Oenone. Before the birth of Paris, Hecabe dreamed that she had given birth to a firebrand that consumed Troy. She exposed Paris on Mt. Ida, where he survived and became a shepherd. There he was loved by the nymph OENONE [ee-noh'nee], who had the gift of healing. Paris returned to Troy and was recognized by Priam as his son. In the Trojan War he was saved by Aphrodite from death in single combat with Menelaüs, and he killed Achilles by shooting him in the heel with an arrow. Years later, when Paris was mortally wounded, Oenone refused to heal him, and after his death she killed herself in remorse. Hector, Andromache, and Astyanax. HECTOR [hek'tor] was the leading Trojan warrior, inferior only to Achilles, who killed him in single combat. His wife was ANDROMACHE [an-drom'a-kee], who bore him a son, ASTYANAX [as-teye'a-naks]. Helenus and Deïphobus. Two other sons of Priam were HELENUS [hel'e-nus], or HELENOS, and DEÏPHOBUS [dee-if'oh-bus], or DEÏPHOBOS. Helenus was a seer, who was captured by the Greeks and spared by them. 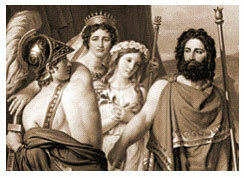 He married Andromache after Hector’s death and went with her to Epirus. Deïphobus married Helen after the death of Paris and was killed in the sack of Troy. Cassandra and Polyxena. Two of Priam’s daughters were CASSANDRA [kas-sand'ra], or KASSANDRA, and POLYXENA [po-lik'se-na]. Cassandra was given the gift of prophecy by Apollo (see MLS, Chapter 11), who punished her for her refusal of his love with the fate that her prophecies would never be believed. She warned the Trojans in vain of the city’s fall and of the deception of the Trojan horse. She went to Mycenae as part of Agamemnon’s spoils and there was killed by Clytemnestra (see MLS, Chapter 18). Polyxena was sacrificed at the tomb of Achilles after the fall of Troy. Aeneas and Antenor. Other Trojan leaders who were not sons of Priam were AENEAS [ee-nee'as], or AINEIAS, and ANTENOR [an-teen'or]. Aeneas was son of Aphrodite and Anchises (see MLS, Chapter 9) and was saved by Poseidon from death in single combat with Achilles. He survived the war and led a band of survivors to Italy (for his saga, see MLS, Chapter 26). Antenor, brother of Hecabe (Hecuba), advised the Trojans to give Helen back to the Greeks. He and his wife, Theano, were spared at the sack and eventually came to Italy. Leading Allies of the Trojans. These were the Lycian princes, GLAUCUS [glaw'kus], or GLAUKOS, and SARPEDON [sar-pee'don]. Glaucus, son of Hippolochus, exchanged his golden armor for the bronze armor of Diomedes and was eventually killed by Ajax. Sarpedon was son of Zeus, who could not save him from death at the hands of Patroclus. Zeus honored Sarpedon by raining drops of blood and ordering Sleep and Death to transport his corpse back to Lycia. Late in the war the Ethiopians, led by MEMNON [mem'non], came to assist the Trojans, as did the Thracians, led by RHESUS [ree'sus], or RHESOS, and the Amazons, led by PENTHESILEA [pen-thes-i-lee'a], or PENTHESILEIA. Agamemnon and Menelaüs. AGAMEMNON [ag-a-mem'non], “lord of men,” was the leader of the expedition. He was a lesser warrior than Achilles and less good in council than Odysseus, but he was greater than both in prestige. His brother, MENELAÜS [men-e-lay'us], or MENELAOS, had less prestige and prowess, although he would have killed Paris in single combat if Aphrodite had not saved Paris. Diomedes. Greater than Agamemnon and Menelaüs as a warrior was DIOMEDES [deye-o-mee'deez], son of Tydeus and king of Argos. Diomedes was favored by Athena, who enabled him to wound even Ares and Aphrodite in battle. With Odysseus he fetched Achilles from Scyros, before the expedition, and Philoctetes from Lemnos towards the end of the war. He accompanied Odysseus in the night raid that led to the deaths of Dolon and Rhesus and the theft from Troy of the Palladium (a statue of Athena that Zeus had cast down from Olympus: it was the guarantee of the city’s survival). Ajax the Great, or Greater. AJAX [ay'jaks], or AIAS, son of TELAMON [tel'a-mon], was prince of Salamis and the most stalwart warrior after Achilles. He was the bravest defender of the ships against Hector’s onslaught, and he defended the corpse of Patroclus. He accompanied Odysseus and Phoenix on the embassy to Achilles and competed with Odysseus in the funeral games for Patroclus and in the claim to the armor of Achilles. Ajax the Less, or Lesser. AJAX [ay'jaks] or AIAS, son of OILEUS [o-il'e-us], was prince of Locris and a leading warrior whose chief role in the saga occurred in the sack of Troy, when he violated Cassandra, who had taken refuge at the altar of Athena. He died during the return home, having offended both Athena and Poseidon. Idomeneus, King of Crete. IDOMENEUS [eye-dom'en-e-us] was a friend of Menelaüs and was a leading warrior and counselor. His principal legend occurs after the fall of Troy. Nestor, King of Pylos. Two leaders were especially prominent in the councils of war, Odysseus and NESTOR [nes'tor], son of Neleus and king of Pylos, who had become king after Heracles had sacked Pylos (see MLS, Chapter 22). Nestor appears in the Iliad as an old and very experienced warrior whose advice, usually given at some length, was greatly valued by the younger leaders. His son, Antilochus, was killed by Memnon, but Nestor himself survived the war. Odysseus, King of Ithaca. The second great councilor and orator was ODYSSEUS [oh-dis'se-us] (ULYSSES), son of LAËRTES [lay-er'teez]. When the expedition was being gathered, he tried to avoid service by pretending to be mad, a ruse that was uncovered by PALAMEDES [pal-a-mee'deez]. He rallied the Achaeans in Book 2 of the Iliad to stay and finish the war, and he asserted the status of the Achaean leaders by beating the sardonic THERSITES [ther-seye'teez], who had spoken bluntly but inappropriately in the council of war. He led the embassy to Achilles, and he undertook the night expedition with Diomedes to take the Palladium from the Trojans. Important as he is in council and in fighting, his major legends concern the fall of Troy and his return home. Achilles. Greatest of all the heroes on either side was ACHILLES [a-kil'leez], or ACHILLEUS, son of Peleus and Thetis and leader of the Myrmidons. He was the swiftest and most handsome of the warriors, invincible in battle and eloquent in council. His passionate nature caused him to withdraw, which did great harm to the Achaeans, and when he returned he turned the tide of the war in the Greeks’ favor. His mother had dipped him in the waters of the river Styx to make him invulnerable, so that only his heel (by which she held him) was vulnerable. The centaur CHIRON [keye'ron] educated Achilles. Thetis tried to keep her son from going to a war, in which she knew he would die young, by hiding him, disguised as a girl, among the daughters of LYCOMEDES [leye-ko-mee'deez], or LYKOMEDES, king of the island of Scyros. His disguise was revealed by Odysseus and Diomedes, and he joined the expedition. On Scyros he loved DEIDAMIA [dee-i-da-meye'a], or DEIDAMEIA, by whom he was the father of Neoptolemus. Phoenix and Patroclus. Achilles had as friend and tutor PHOENIX [fee'niks] or PHOINIX (one of the envoys sent by Agamemnon to persuade Achilles to relent), and his closest friend was PATROCLUS [pa-tro'klus], or PATROKLOS, son of Menoiteus, who had been his companion as a boy. The death of Patroclus in single combat with Hector was the turning point in the events of the Iliad. Neoptolemus. Achilles’ son, NEOPTOLEMUS [ne-op-tol'e-mus], or NEOPTOLEMOS (known also as PYRRHUS [pir'rus], or PYRRHOS), joined the Achaeans at Troy after the death of Achilles and played an important and brutal role in the sack of Troy. The Achaeans gathered at AULIS [aw'lis], where contrary winds kept them from sailing. The prophet CALCHAS [kal'kas], or KALCHAS, said that Artemis had caused the unfavorable weather and could be appeased only by the sacrifice of IPHIGENIA [if-i-je-neye'a or if-i-je-nee'a], or IPHIGENEIA. Agamemnon sacrificed her, favorable winds blew, and the fleet set sail (see MLS, Chapter 18). At Aulis, Calchas interpreted two omens: an eagle devouring a pregnant hare—an omen symbolic of Agamemnon’s violence—and a snake devouring a bird and her eight fledglings—an omen meaning that the Achaeans would fight for nine years before capturing Troy in the tenth year. Philoctetes. At the island of Chryse, during the voyage, PHILOCTETES [fi-lok-tee'teez], or PHILOKTETES, was bitten in the foot by a snake. The wound festered, and the Achaeans abandoned him on Lemnos. Philoctetes was son of Poeas, who had inherited the bow of Heracles, which was necessary (so the Trojan prisoner, Helenus, told the Greeks) for the capture of Troy. In the last year of the war, Odysseus and Diomedes fetched Philoctetes and his wound was healed by the sons of Asclepius, Podalirius and Machaon. With the bow, Philoctetes shot and killed Paris. Protesilaüs and Laodamia. The first Greek to leap ashore at Troy was PROTESILAÜS [proh-te-si-lay'us], or PROTESILAOS, who was killed by Hector. Hermes brought back Protesilaüs from the Underworld to his wife, LAODAMIA [lay-oh-da-meye'a], or LAODAMEIA, and when he had to return, she killed herself. The events of the first nine years of the war were narrated in epic poems that are no longer extant. The Iliad is concerned with part of the tenth year. Its theme is “The Wrath of Achilles” (the first words in the poem), and its events start with the quarrel between Agamemnon and Achilles in the first book and end with the ransoming of Hector’s corpse by Priam and his burial in the twenty-fourth book. The Anger of Achilles by J.-L. David (1748-1825). This is the moment where Agamemnon (R) shows his true intention to Achilles (L), who draws his sword in anger to strike Agamemnon. The Quarrel between Achilles and Agamemnon. The quarrel broke out over division of the spoils from raids on cities in Asia Minor. When Agamemnon had to give back his prisoner, CHRYSEÏS [kreye-see'is], because of the anger of Apollo (whose priest was the father of Chryseïs), he took BRISEÏS [breye-see'is], the prisoner of Achilles, in her place, thus insulting and devaluing Achilles in the eyes of the Achaeans. Achilles withdrew from the fighting, and his mother, Thetis, persuaded Zeus to honor Achilles by allowing the Trojans to be victorious in his absence. The Role of the Gods. 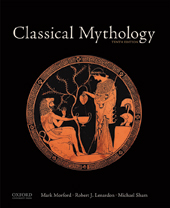 The gods have a prominent role in the Iliad. Apollo (the first to appear) favors the Trojans; he helps Hector kill Patroclus and later refreshes the corpse of Hector after it has been dragged behind the chariot of Achilles. Athena and Hera support the Greeks, and Athena assists Achilles in his final combat with Hector. Aphrodite protects Paris and compels Helen to make love to him after Aphrodite had saved him from death at the hands of Menelaüs. Thetis comforts her son Achilles after his humiliation by Agamemnon and again after the death of Patroclus, when she obtains new armor for her son from Hephaestus. She brings the order from Zeus to Achilles to desist from desecrating Hector’s corpse and to give it back to Priam. Hermes escorts Priam through the Achaean camp. On two occasions the gods fight on the battlefield among themselves, and even are wounded (see above, under Diomedes). The Role of Zeus. Supreme among the gods is Zeus. While he is constantly opposed by Hera (who deceives him into making love at one point, so that while he is asleep the Greeks may be successful), his will is supreme. He honors Achilles in response to the complaint of Thetis, and he resists the importuning of Athena and Hera, who are impatient at the continued success of the Trojans. Hector and Andromache. In Book 6 Hector returns to Troy from the battlefield and there meets with Hecabe (Hecuba), with Helen and Paris, and finally with Andromache and their son, Astyanax. His parting from Andromache brings into sharp focus the loss that the survivors in the defeated city must bear, and it foreshadows his death and the mourning of Andromache in the last books of the poem. The Embassy to Achilles. In despair at the Trojan successes, Agamemnon sends Odysseus, Ajax (son of Telamon), and Phoenix to offer gifts and honor to Achilles in restitution for the dishonor done to him, if he will return to the fighting. But Achilles refuses. The Death of Patroclus. The friend of Achilles, Patroclus, persuades Achilles to let him fight in Achilles’ armor as the Trojans reach the Greek ships. He is victorious at first, killing Sarpedon, son of Zeus, but eventually is killed by Hector, with the help of Apollo. Hector strips the corpse of the armor of Achilles and puts it on. The Return of Achilles to Battle. The death of Patroclus drives Achilles to relent; Thetis brings him new armor made by Hephaestus, including a splendidly decorated shield. He ends the quarrel with Agamemnon and returns to battle. Achilles kills countless Trojans and even fights the river-god Scamander, whose flooding waters are quenched by Hephaestus. Eventually the Trojans are penned into the city. Achilles and Hector. The two heroes are left to fight in single combat. Zeus weighs the fate of each in his golden scales, and Hector is doomed. Achilles kills him with a spear thrust in his throat. Each day for twelve days Achilles dragged Hector’s corpse behind his chariot round the tomb of Patroclus. He celebrated funeral games in honor of his dead friend and relented only when Zeus ordered him, through Thetis, to give up his wrath against Hector and to ransom his body. Priam and Achilles. Escorted by Hermes, Priam makes his way to the hut of Achilles and there ransoms Hector. The mutilation of Hector's corpse is perhaps the most extreme example of the passionate and violent nature of Achilles. Yet Achilles relents with magnanimity in relinquishing the corpse to Priam, who returns to Troy, and the Iliad ends with the lamentations of Andromache and Helen and the burial of Hector. Events after the end of the Iliad were narrated in epics (now lost) whose summaries survive in tragedies and in vase-paintings. Book 2 of Vergil’s Aeneid is the major source for the sack of Troy itself. Achilles against Penthesilea and Memnon. Achilles killed the leaders of contingents that came to assist the Trojans—the Amazons, led by Penthesilea, and the Ethiopians, led by Memnon, son of Eos (Aurora, “dawn”). The Death of Achilles. Achilles himself was fatally wounded in the heel by Paris. His corpse was recovered by Ajax (son of Telamon), and Thetis and her nymphs attended the funeral on the promontory of Sigeum. The ghost of Achilles conversed with Odysseus when he visited the Underworld. Achilles’ ghost demanded the sacrifice of Polyxena, daughter of Priam, at the tomb. Achilles (so some say) had loved her and was killed when meeting with her. The Contest for the Armor of Achilles. Odysseus and the Greater Ajax, son of Telamon, each claimed the armor of Achilles, speaking to an assembly of Achaeans presided over by Athena. Trojan prisoners said that Odysseus had done them more harm, and he was awarded the armor. In shame, Ajax killed himself, and from his blood sprang a flower with AI on its petals (his name in Greek is Aias). The Arrival of Neoptolemus and Philoctetes. Odysseus captured Helenus (the seer and son of Priam), who advised the Achaeans to summon Neoptolemus and Philoctetes (see above). The Wooden Horse. The Achaeans left a wooden horse, built by Epeus, outside the walls of Troy and sailed away to Tenedos. Inside the horse were the leading warriors. Deceived by the Greek SINON [seye'non], the Trojans pulled down part of the city wall to admit the horse, and then at night Sinon let the Achaean warriors out. Meanwhile the other Greeks sailed back and entered the city. Cassandra had warned against admitting the horse and was not believed. The priest of Apollo, LAOCOÖN [lay-o'koh-on], son of Antenor, hurled his spear at the horse and said it should be destroyed. The Trojans ignored his warning also, and watched as two serpents came from the sea and throttled Laocoön and his two sons. The Fall of Troy. The Greeks sacked the city and killed its male inhabitants. Of the Trojan leaders, Antenor was spared, and Aeneas escaped. Priam was butchered by Neoptolemus, and Hector’s infant son, Astyanax, was thrown from the walls. Andromache became the slave of Neoptolemus (see above, and MLS, Chapter 18). Cassandra was raped by the Lesser Ajax, son of Oileus, in the temple of Athena, where she had sought the protection of the goddess, and was given as a slave to Agamemnon, who took her back to Mycenae, where she was killed by Clytemnestra (see MLS, Chapter 18). The Flight of Aeneas. Aeneas, protected by his mother, Aphrodite, escaped, taking with him his son, ASCANIUS [as-kan'i-us], or ASKANIOS (IULUS), and his father, ANCHISES [an-keye'seez]. His wife, CREUSA [kre-ou'sa], or KREOUSA, disappeared in the escape. He led a group of survivors, men and women, on the voyage away from Asia, eventually reaching Italy, where he established himself and made possible the eventual founding of Rome (see MLS, Chapter 26).